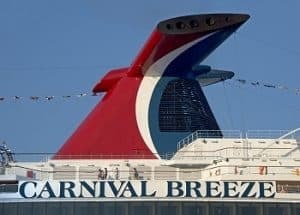 Carnival Breeze answered a distress call over the weekend where a sailboat, located 24 miles off the coast of Miami, called in for urgent medical attention. Carnival Breeze diverted course and headed to the sailors who were then immediately brought on board and checked out by the shipboard doctor. The wind and seas were too rough for a Coast Guard cutter to come along of the ship and take the sailors to land. One of the sailors, who required urgent medical attention, was airlifted from Carnival Breeze to a USCG helicopter. The other sailor stayed on-board until the arrival of Key West, where he was treated. Carnival Breeze is sailing a six-night Caribbean sailing from Miami.